The kitchen is one of the spaces in your home you spend the most time in, so of course you want it to look fantastic. If your kitchen is starting to look drab or outdated, maybe it is time to consider remodeling it. Or maybe you have already decided to remodel your kitchen; you just dont know how to achieve that sophisticated look you are after. Read on to find out some of the best ways to add a touch of class to your kitchen remodel. Stone is a beautiful, timeless building material. It can add an air of elegance to just about anything. Stone is popular in kitchens because it is naturally durable, long lasting, and environmentally friendly. In addition, several types of stone can endure high temperatures and contact with water, making it perfect for the kitchen. If you want to add some style to your kitchen consider adding some natural stone pieces. Listed below are some of the most popular and beautiful ways to incorporate stone into your kitchen. When you think of adding stone into the kitchen you probably think of the flooring. Flooring is a great way to make a statement with stone in your kitchen. Stone flooring requires very little maintenance and is great for high traffic areas, like the kitchen, because it is so durable. Another area to add stone to is the backsplash. A stone backsplash adds an extra texture to the kitchen. You can use an assortment of stone tiles to create an interesting backsplash design. Feel free to try out a variety of tiles here to create a backsplash pattern unique to your kitchen. For an extra extravagant look, consider having a stone range hood. This is an especially unique look and it really creates an ornate appearance. This can really make a statement in your kitchen. Think about using a lighter or darker stone than the countertops or backsplash to add contrast and make this element pop. If you are sick of the typical stainless steel sink consider adding a stone sink. Stone sinks create a distinctive look and are a great option for kitchens. 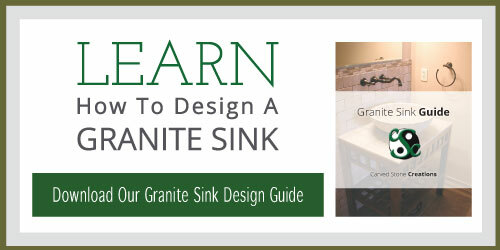 Stone sinks can be made out of a variety of materials such as, marble, granite, or limestone. Some sinks can even be made in the same material as your countertop to blend in. Whatever type of stone you choose make sure to seal it to keep it looking like new for years to come. If you are interested in a more dramatic change, think about adding some columns to the architecture of your kitchen space. You can add them to accent a certain cabinet or pantry, or even around the entranceway to the kitchen area. 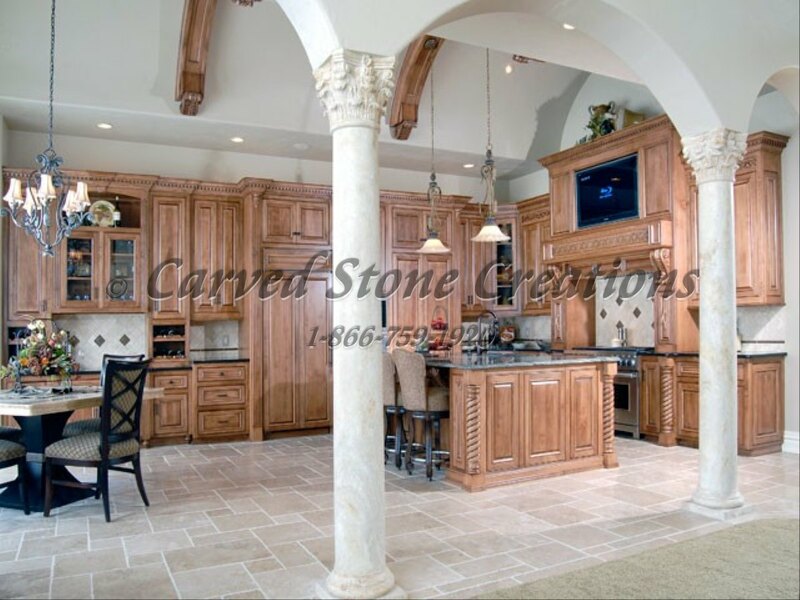 Stone columns create a regal look wherever they are. So, choose some or all of these ways to incorporate stone into your kitchen. It will be sure to give you the sophisticated look you are after.